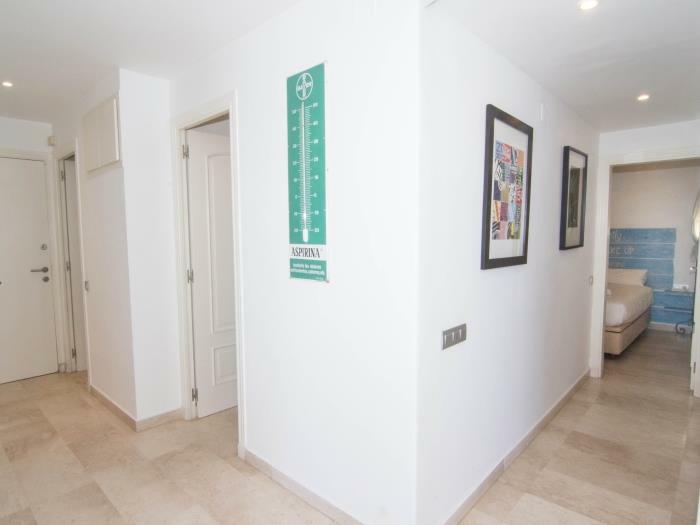 This 1st floor apartment in Sitges with lift (although there is a flight of 7 steps to access it) provides the perfect accommodation for a group of up to 5 guests in 60mts indoor space. 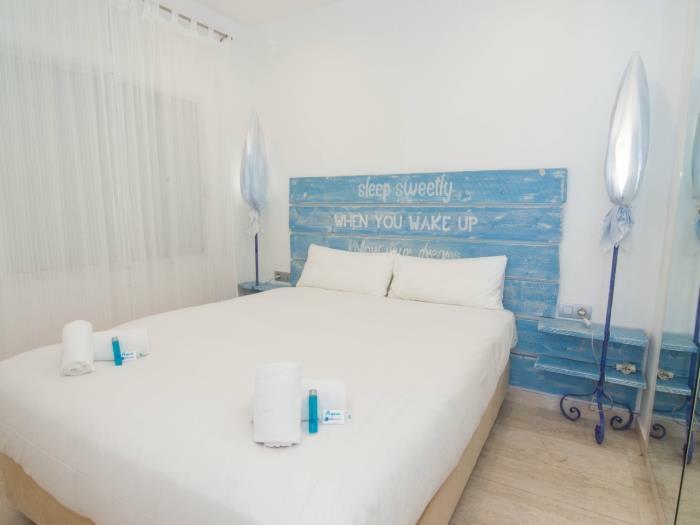 The luminous living room has a double sofa bed where two occasional guests can sleep upon request, a table and chairs for indoor dinning and also a large flat screen TV with Spanish digital channels. 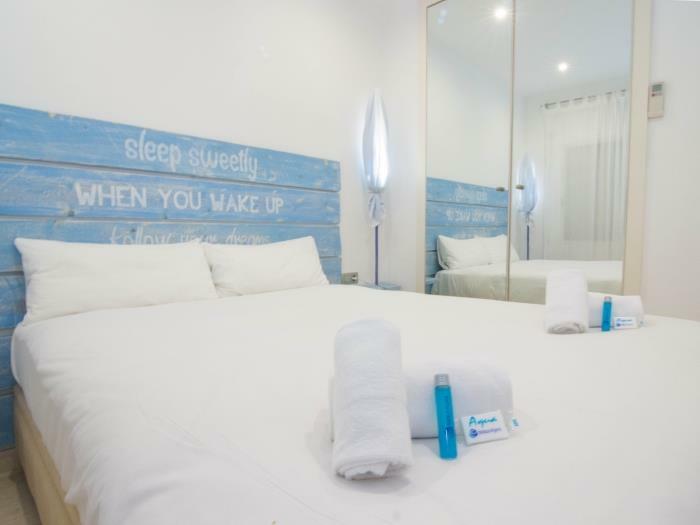 The apartment also offers free internet access for our guests convenience. Floor to ceiling windows flood the room with the Mediterranean sunlight. 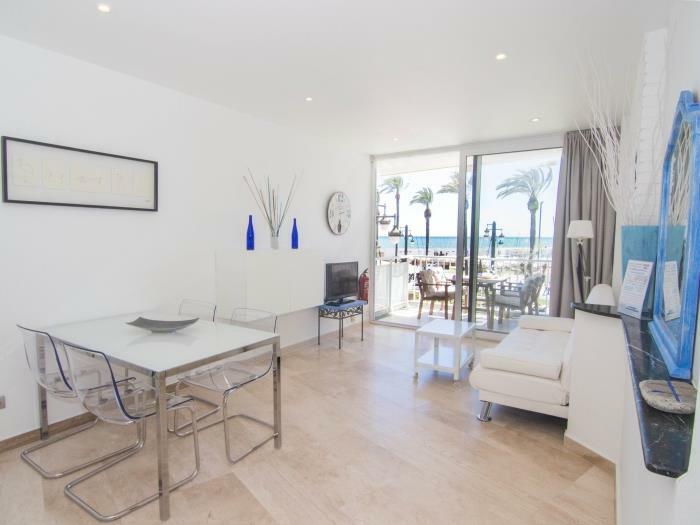 Double sliding doors give access to a wonderful terrace that has the sun all day. There is a outdoor table and chairs and spectacular views over the church, the beach and the blue sea. 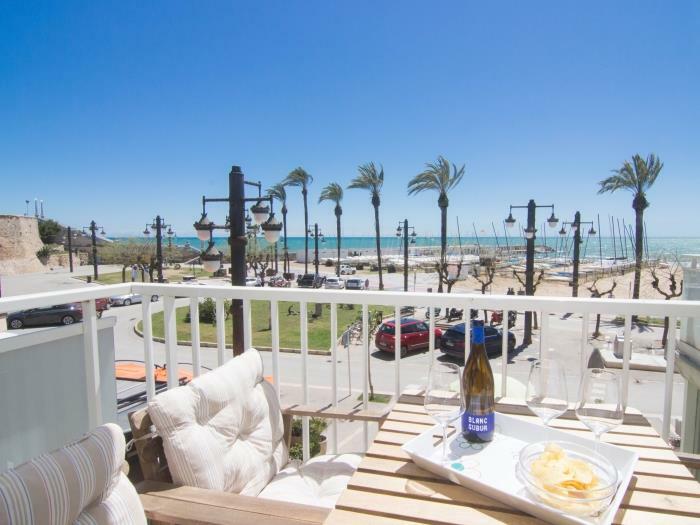 This is a wonderful spot for al fresco dining, enjoying a glass of local fresh wine, a morning coffee or just relaxing while enjoying the fantastic views. 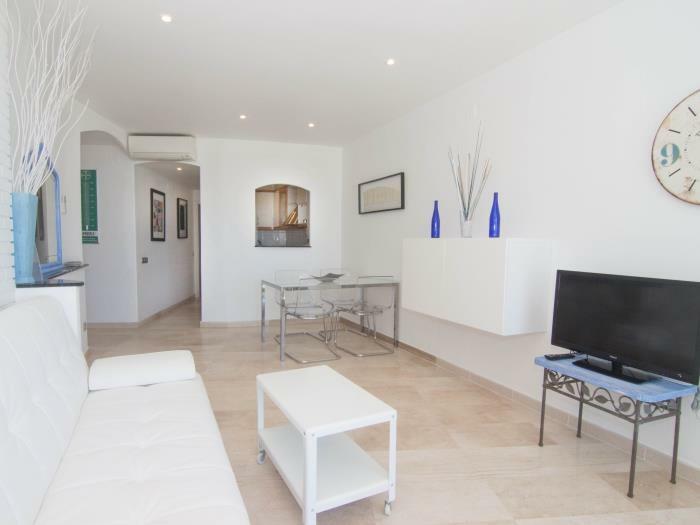 The RIBERA SOL apartment has a AC unit in the living room and another in the double bedroom. 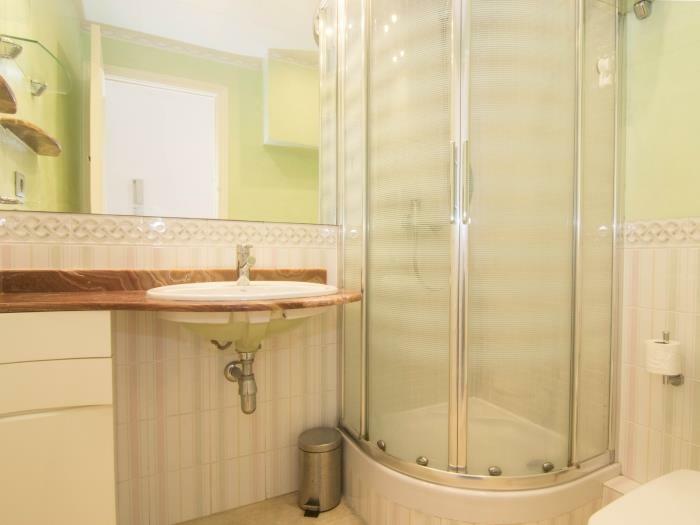 As it is a fairly compact apartment, it is enough to cool the whole house. Since car traffic is restricted in this area, the sounds that our guests are most likely to hear from the terrace are the waves breaking on the beach or the bells from the church. 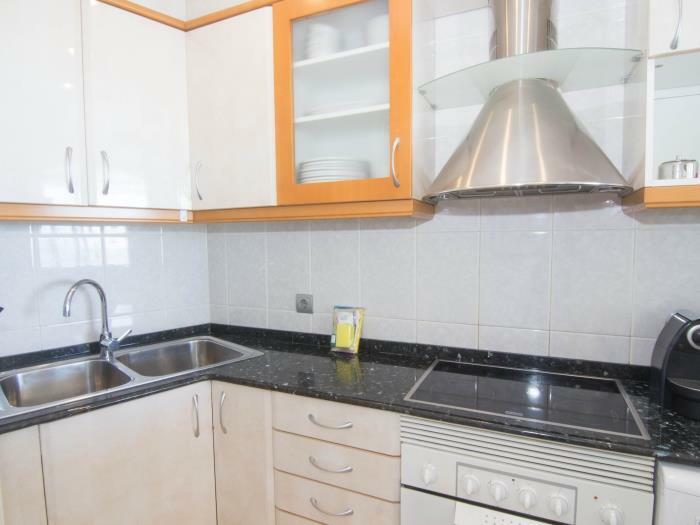 The independent kitchen is fully equipped with everything you will need to enjoy your self-catering stay. 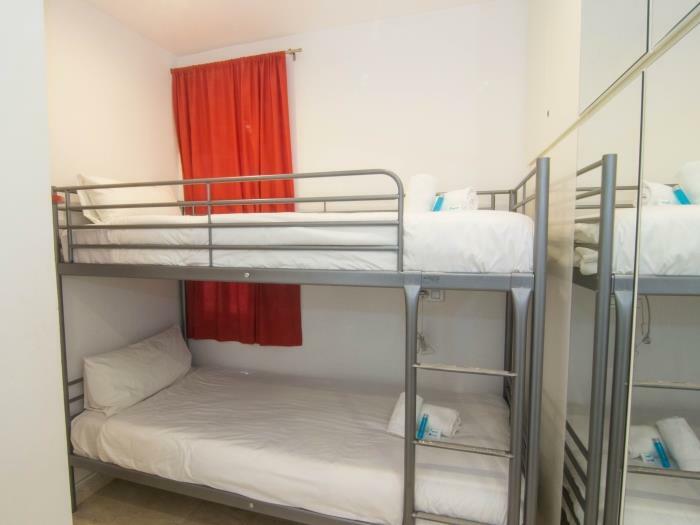 The apartment comprises two bedrooms (one with a double bed 150x200 and the other one with a bunk bed 90x200) and a full bathroom with basin, WC and shower. 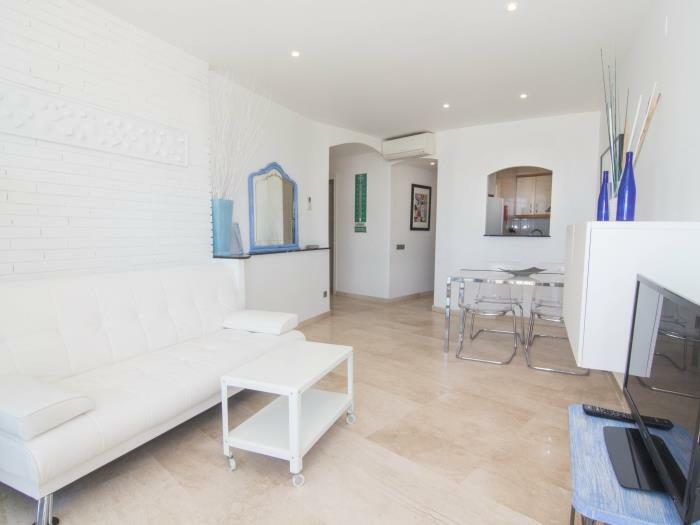 We also manage the RIBERA MOON apartment in the same building so, booking both properties together we can accommodate up to 8 guests. 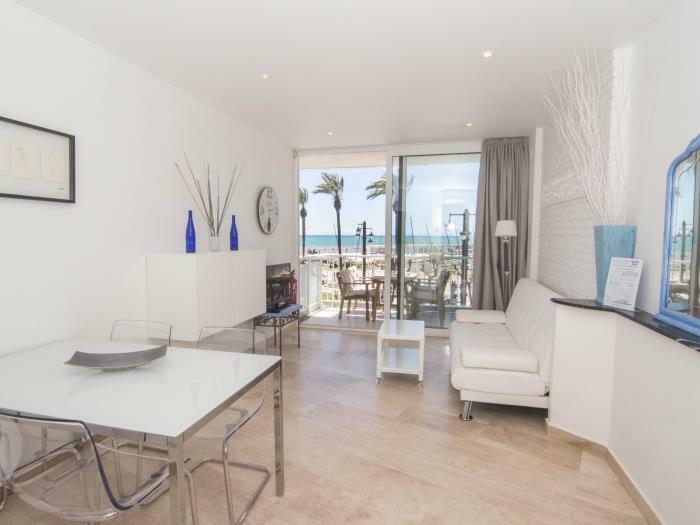 Stunning views and a great price for this lovely beach front apartment in Sitges. 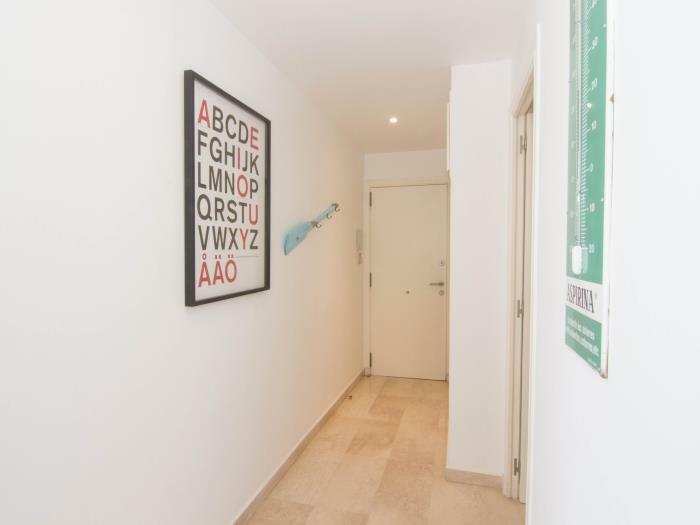 The RIBERA SOL apartment is ideally located right on the famous “Passeig de la Ribera”, a beautiful palm tree promenade, and just in the heart of Sitges. 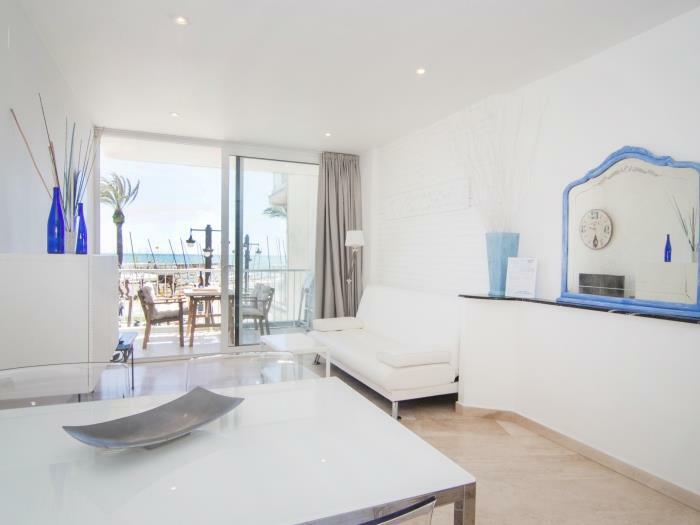 This beach front apartment offers unbeatable views of the church, the golden sandy beaches and the Mediterranean. 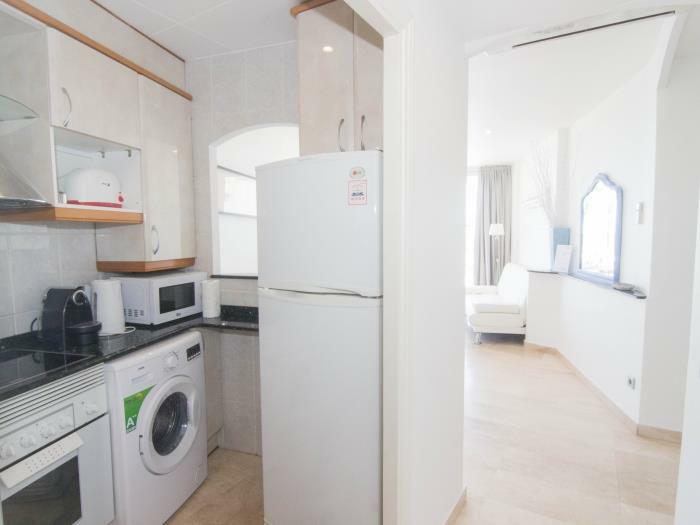 There are just a few meters between the apartment and the sea. The charming old quarter of Sitges with all its little picturesque streets and beautiful shops is right behind the apartment. 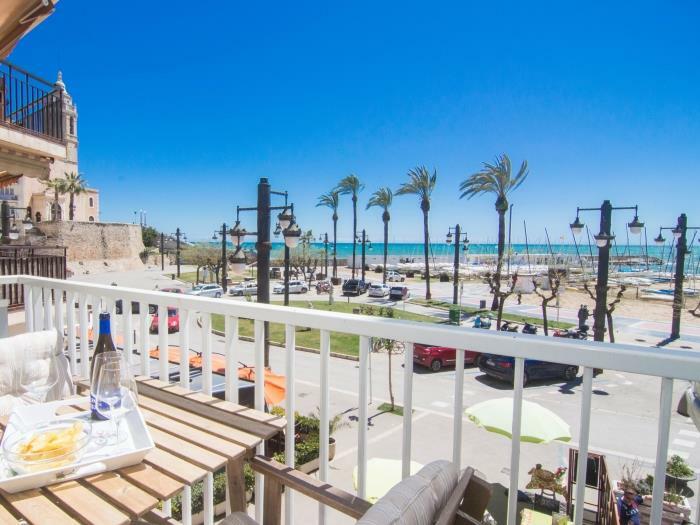 Some of the best restaurants in Sitges are also right by your front door. Less than 10 mts from the beach. The communication excellent. Manuel perfecto. 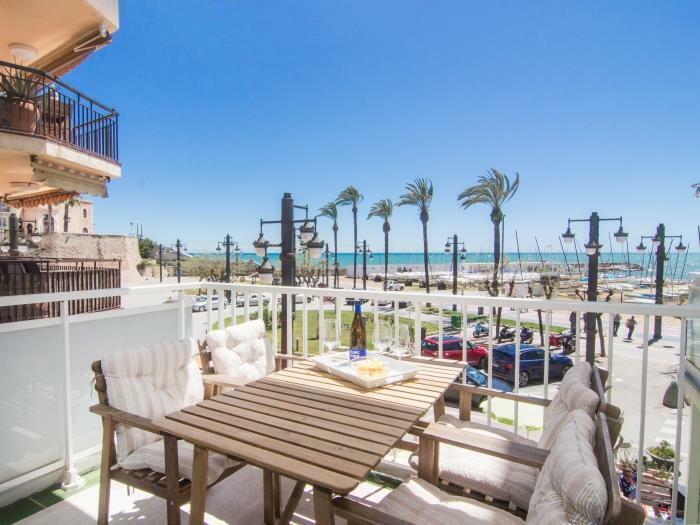 Close to beach and activities, great balcony!! Congrats to the welcoming team. They were very kind. La terrasse et la vue. La ubicación y vista desde la terraza. The well equiped kitchen and equipment for beach and the balcony. the view and the style from the apartment. Provided beach equipment, A/C good and balcony. Location of apartment, sunshine, near shops. Agent helpful & friendly. La vista y el balcón. View, lightness, position of apartment. Close to the beach, at this time of the year quiet. Location and people working for great company. They were great! The view/Location of the apartment. The place and the views. It was perfect, thanks Manel!!! 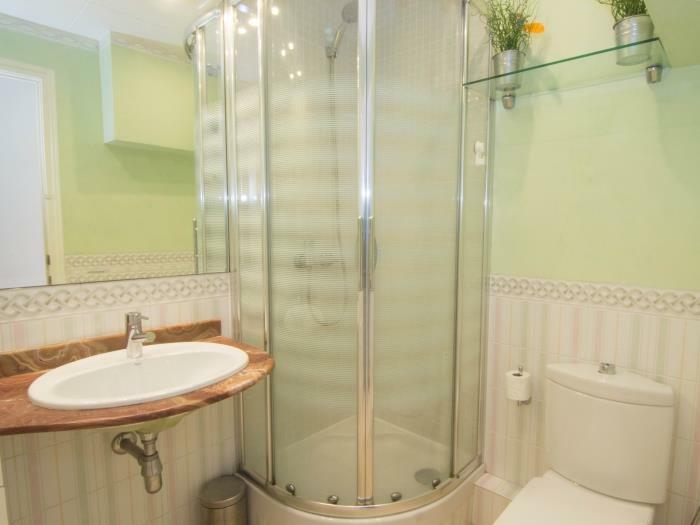 Location, bedroom, Manel was very helpful. 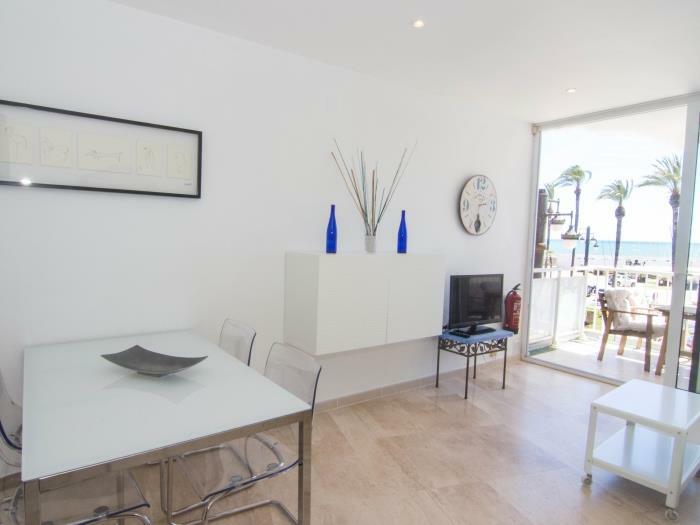 The area and view, very close to the beach. 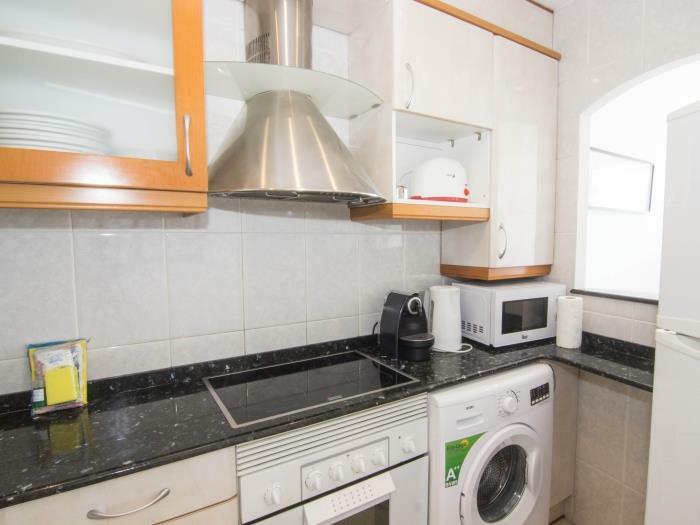 Clean, well situated, well epuipped apartment. The view over the sea. Balcony and the view. Location excellent. The view, the area, the sun, the balcony. The general town area and beach wiew. Your attention was really great. Lo mejor, la situación y el recibimiento de ustedes. Great location. Fully equipped apartment. Welcome person for cure. View and cleaning. Central, 1st floor, beautiful view, A/C works great. The balcony with the view. La ubicación y gestion del alquiler. The proximity with city center and beach. View and close to restaurants, beach. The location of the building. WiFi worked very well.